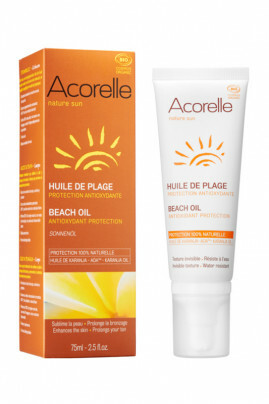 Acorelle Organic Body Beach Oil is a sun care that protects from the sun while sublimating the skin. Its protective power is obtained thanks to karanja oil. With multiple properties, this antioxidant oil fights against free radicals and absorbs some of the UVA and UVB rays. Combined with Olive Api, your skin is protected from premature aging. Resistant to water, its emollient texture sublimates your skin and prolongs your tan permanently. Its tube format is easy to carry and delivers the right dose you need. Acorelle Organic Body Beach Oil ends up seducing us with its natural fragrance with sweet notes of frangipani and almond blossoms. Its exotic fragrance makes us travel to the beach, under coconut palms and palm trees. Usage tips for safe sun exposure! Apply organic beach oil all over your body to nourish and protect your skin from UV rays. Renew the application as often as necessary. After sun exposure, you can reapply this sublimating oil to prolong your tan. When applying, avoid contact with light clothing. Store at room temperature before and after opening, protected from light and in a clean and dry environment. A natural composition rich in vegetable oil of organic karanja with protective virtues! PONGAMIA GLABRA (KARANJA) SEED OIL *, PERFUME (FRAGRANCE), BISABOLOL, TOCOPHEROL, HELIANTHUS ANNUUS (SUNFLOWER) SEED OIL, HELIANTHUS ANNUUS HYBRID OIL *, OLEA EUROPAEA (OLIVE) FRUIT OIL *, PROPOLIS EXTRACT *, POLLEN EXTRACT *, BENZYL BENZOATE, BENZYL SALICYLATE, EUGENOL, GERANIOL, LINALOOL.